Palli Karma-Sahayak Foundation (PKSF) is going to implement ‘‘Sustainable Enterprise Project (SEP)” supported by the World Bank. The World Bank has approved to finance USD 110.0 million from its International Development Association (IDA) window to implement the project. The main objective of the project is to promote environmentally sustainable microenterprises of Bangladesh. Subsidiary Loan and Grant Agreement (SLGA) of SEP has been signed between ‘Palli Karma-Sahayak Foundation (PKSF)’ and Finance Division, Ministry of Finance, on August 02, 2018. Mr. Md. 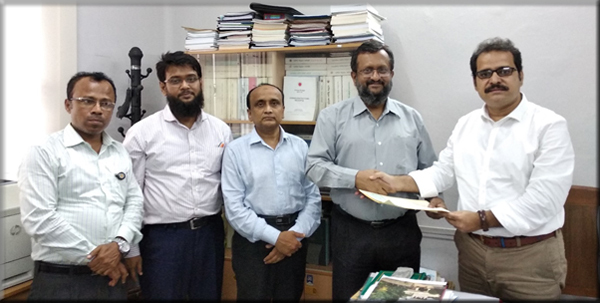 Fazlul Kader, Deputy Managing Director of PKSF and Mr. Shirajun Noor Chowdhury, Deputy Secretary, Finance Division (FD), Ministry of Finance signed the SLGA on behalf of their respective side. Dr. Akond Md. Rafiqul Islam, General Manager of PKSF and Mr. Zahir Uddin Ahmed, Project Coordinator, SEP, PKSF were present in the contract signing ceremony. With the completion of SLGA signing, Sustainable Enterprise Project (SEP) is going to be effective officially. This project will be implemented within next 05 years through the designated Partner Organizations of PKSF in selected business clusters of the microenterprises.